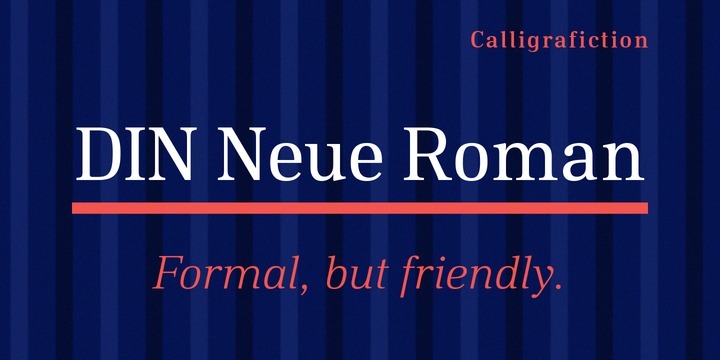 DIN Neue Roman is a geometric typeface created by Philip Lammert and published by Calligrafiction which is available in 7 weights (From Thin to Black) and italics, useful OpenType features. Based on technical DIN 1451 font, it go crazy with stylistic sets. It is ideal for typographic purpose but also is suitable for editorial, magazine, text etc. Have fun! Styles: Thin, Light, UltraLight, Regular, Medium, Bold, Black, Italics. Price: starting from $46,00 for one font to $329,00 for all 14 fonts. A font description published on Tuesday, February 6th, 2018 in Calligrafiction, Fonts, Philip Lammert by Alexandra that has 1,505 views.